An Interview with Arthur Lefkowitz, Author of "Benedict Arnold in the Company of Heroes" ~ The History Girl! An Interview with Arthur Lefkowitz, Author of "Benedict Arnold in the Company of Heroes"
Publisher Savas Beatie provides us with this exclusive interview with Arthur Lefkowitz, author of Benedict Arnold in the Company of Heroes: The Lives of the Extraordinary Patriots who followed Arnold to Canada at the start of the American Revolution. Savis Beatie: Why did you decide to write your book on Benedict Arnold’s veterans? 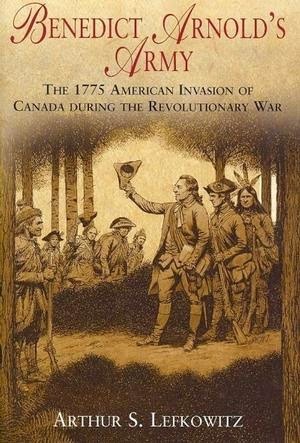 Arthur S. Lefkowitz: I got the idea to write Benedict Arnold in the Company of Heroes when I reluctantly had to admit that my book about the 1775 Arnold Expedition (SB title Benedict Arnold's Army) had to end with the failed American attack on Quebec which took place on December 31, 1775. While researching my book about the Arnold Expedition I learned about the subsequent careers of some of the officers and enlisted men who followed Arnold to Canada in 1775. They were a fascinating group who included some of the best American combat officers to emerge as the Revolutionary War wore on. SB: How did Benedict Arnold in the Company of Heroes develop?? ASL: My manuscript developed with several chapters following the American defeat at Quebec, identifying these young American patriots and what happened to them after they were all captured by the British. I gave the manuscript to my friend and noted Revolutionary War author and scholar Thomas Fleming. Tom said that I should end the book with the story of the American attack on Quebec and cut all the subsequent material. I realized that he was right but it was a heartbreaker. That's when I got the idea to write a sequel to Benedict Arnold's Army. My deleted material became the nucleus of my new book. Ironically, on the advice to Tom Fleming, I cut about eight pages of carefully researched material from the manuscript to make the book stronger. SB: What is the story behind the cover of Benedict Arnold in the Company of Heroes? ASL: The cover art for this book is an original oil painting by artist-historian Dahl Taylor. 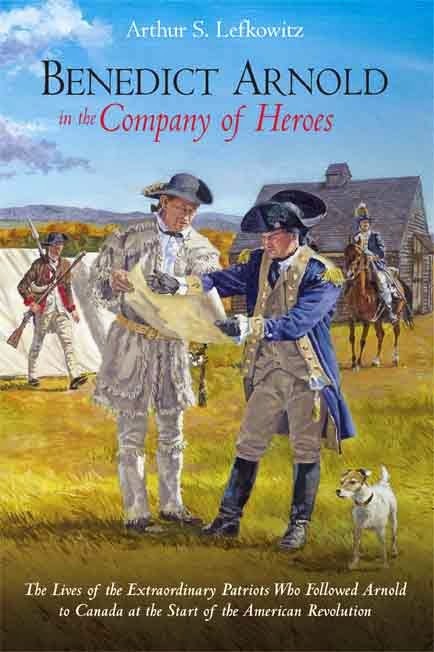 The front of Mr. Taylor’s wrap-around cover art shows Major Gen. Benedict Arnold conferring with Col. Daniel Morgan on Bemis Heights during the 1777 Saratoga campaign. This was the strong American defensive position which successfully blocked Gen. John Burgoyne’s offensive from Canada. Both Arnold and Morgan were veterans of the 1775 Arnold Expedition. Morgan is shown wearing the same clothing depicted in John Trumbull’s painting titled The Surrender of General Burgoyne at Saratoga. 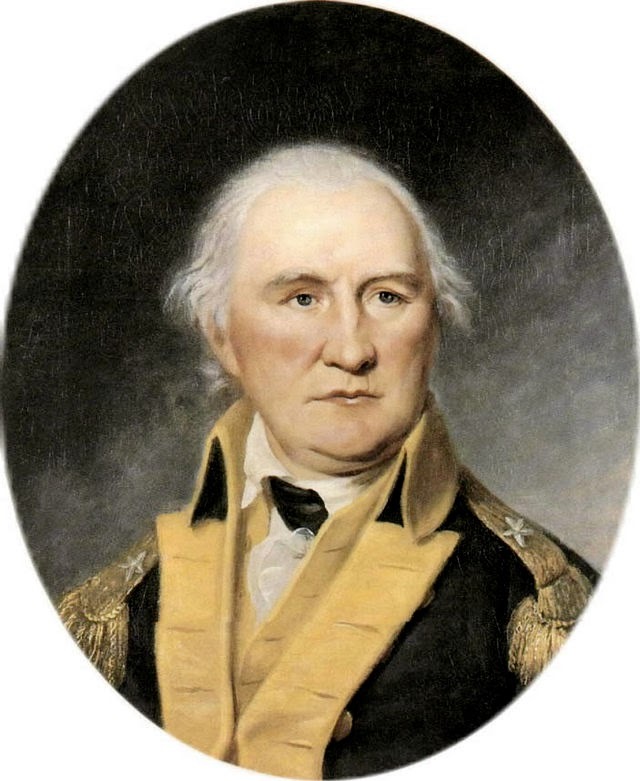 Trumbull served as an officer during the Revolutionary War and he accurately depicted uniforms and weapons in his historical paintings. The helmet worn by the mounted dragoon behind Arnold also comes from Trumbull’s painting of Burgoyne’s surrender. The building in the background is a fortified barn that was known to have been on Bemis Heights at the time. Archaeological excavations indicate that it was a Dutch style barn. SB: Can you tell us about the people standing behind Arnold and Morgan? ASL: The soldier behind Morgan is a rifleman. He is carrying a folding pike, a weapon which was proposed by Commissary Gen. Benjamin Flower in July 1777 for use by riflemen whose guns could not mount a bayonet. It is possible that some of Morgan’s riflemen were armed with this pike at Saratoga. The illustration below shows the design of Gen. Flower’s pike. The musket horse (gun rack) in the painting is based on a background detail in the 1781 portrait of Col. Walter Stewart by Charles Willson Peale in 1781. The guns on the rack are French Charleville muskets. They were among the shipments of weapons that arrived from France in time to supply Gates’ army at Saratoga. The bayonets are fixed to the muskets which was a logical practice at the time since each musket was hand-made and its bayonet custom-fitted. The two officers behind Morgan are Major Henry Brockholst Livingston and his nineteen year old cousin Matthew Clarkson. They were Arnold’s aides-de-camps at the time and their function (aide) is identified by the green ribband-of-office that they are wearing across their chests. Note that one of the aides is carrying a dispatch case. The group of soldiers standing behind Arnold’s aides are members of the First New York regiment. The Saratoga campaign culminated in October and Dahl Taylor shows the autumn colors in his painting. The two dogs in the painting are my terriers Jackson (standing next to Arnold) and Schuyler who is near Arnold’s aides. Jackson gets around and he was last depicted sitting in a bateau on the Kennebec River on the cover of Benedict Arnold’s Army. SB: What makes Benedict Arnold in the Company of Heroes unique from other books on the same topic? ASL: There is no other book like mine. Benedict Arnold is acknowledged as arguably America's best combat officer prior to his treason. Benedict Arnold in the Company of Heroes offers a new contribution that Arnold made to the patriot cause. My book explains that young officers and men who served under Arnold in the Arnold Expedition got to see a dynamic style of leadership that they applied later in the Revolutionary War to the benefit of the Continental army. Arnold commanded from the front. He set an example of courage and determination for his men. He was brave and ready to face any danger or hardship to successfully complete his mission. He was willing to take risks and always had a positive attitude which inspired the men who served under him to act boldly. SB: What are some features of Benedict Arnold in the Company of Heroes that you really enjoy that you think readers will also really enjoy? 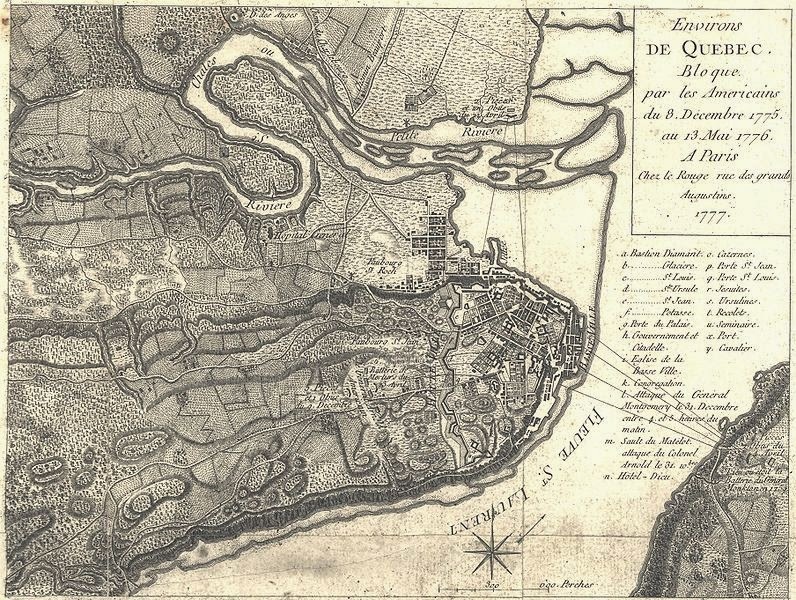 ASL: I think my favorite part of my new book is the complicated escape plot that the enlisted men from the Arnold Expedition concocted not only to break-out of their prison in Quebec but to capture the city. I do not believe that this story has ever been told before. I also like my brief description of the ceremony that brought the body of the American general Richard Montgomery from Quebec to New York City. You can read this account starting on page 163 of chapter 4 of my new book. Hundreds of Men followed Colonel Benedict Arnold northward on his famous expedition to capture Quebec in late December 1775. They joined with General Richard Montgomery, but after Montgomery was killed by enemy fire, his men retreated. Arnold's troops, however, continued fighting after Arnold fell wounded and only surrendered when hopelessly outnumbered and trapped inside the city. Who were these men and what became of them? Arthur Lefkowitz answers these questions in his fresh and compelling Benedict Arnold in the Company of Heroes. An award-winning writer on the American Revolution, Lefkowitz spent years searching through archival materials to paint splendid and compelling portraits of Arnold's amazing cast of veterans whose fates offer a fascinating glimpse into the lives of early American patriots. His original monograph begins with an overview of the failed Canadian invasion before following these men into prison (where some devised intricate plots to break out and even seize weapons to capture the city). Despite their hardships, many returned to the rebel army to continue their fight for independence. Arnold's men, explained George Washington, were worthy of particular notice and they never disappointed him. Some of those portrayed in detail include Charles Porterfield (who led troops at Brandywine); Daniel Morgan (the hero of Cowpens); Henry Dearborn and Timothy Bigelow (who fought alongside their old commander at Saratoga); Christian Febiger and Return Jonathan Meigs (who were at the forefront of the attack on Stony Point); Simeon Thayer (who refused to surrender Fort Mifflin); and Colonel Aaron Burr (whose impressive wartime record was marred by his tumultuous political career). What accounts for the inspired leadership of so many veterans from Arnold's expedition? Lefkowitz presents a compelling argument that they learned by example from Benedict Arnold, himself a courageous and charismatic officer. Arthur Lefkowitz is an independent researcher and author living in New Jersey. He is a graduate of New York University with a master's degree from Long Island University. His four previous books are noted for their unique subject matter: The Long Retreat: The Calamitous Defense of New Jersey, 1776 (1999), George Washington's Indispensable Men: The 32 Aides-de-Camp Who Helped Win American Independence (2003), The American Turtle Submarine: The Best-Kept Secret of the American Revolution (2006, 2012), and Benedict Arnold's Army: The 1775 American Invasion of Canada During the Revolutionary War (2008). His books have received numerous awards and he is a member of the Board of Governors of the American Revolution Round Table. Purchase a copy of Benedict Arnold in the Company of Heroes: The Lives of the Extraordinary Patriots who followed Arnold to Canada at the start of the American Revolution here.